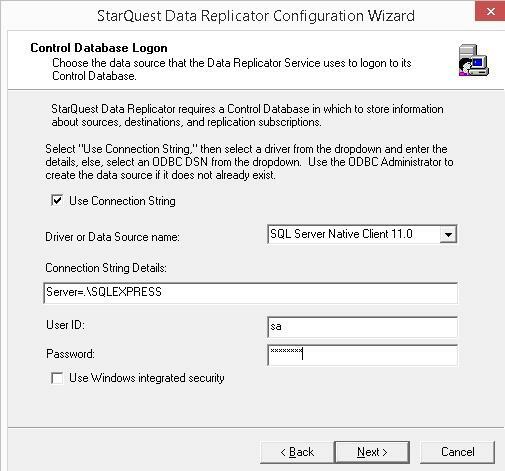 This Quick Start Guide describes how to install and configure the software you need, including the StarSQL ODBC driver for DB2, to perform snapshot replication operations using the StarQuest Data Replicator (SQDR). Read the complete document before starting your installation. Note: if you require incremental replication support from a supported database (DB2 for i, DB2 for LUW, SQL Server, or Oracle) using SQDR Plus, refer to the SQDR Plus Quick Start Guide. This document is intended for first-time users of SQDR. Users who are upgrading an existing installation should refer to the SQDR Release Notes and the SQDR online help for upgrade instructions. The estimated time to complete all tasks is 1 hour. In the following example, SQDR uses a SQL Server database to store replication subscription information. If you do not already have a SQL Server installation, you can obtain the Microsoft SQL Server Express Edition (2008 or later) free of charge from Microsoft to use as a control database for the Data Replicator. 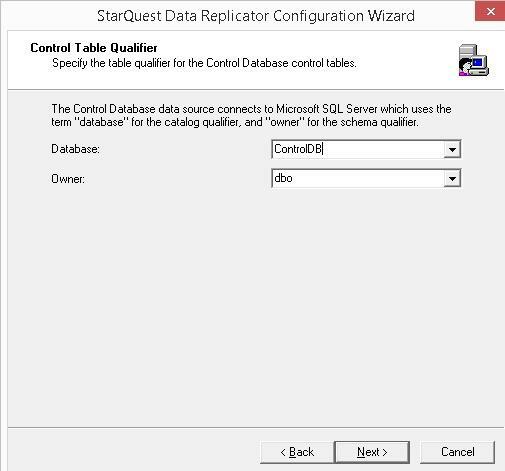 The StarQuest Technical Document Installing SQL Server for a Control Database provides details for using SQL Server Express with SQDR. If the source system is running DB2 for i, create a library (package collection) with CRTLIB SQDR. This example assumes you will be using a local copy of SQL Server for the SQDR control database. If you do not already have a SQL Server installation, you can obtain the Microsoft SQL Server Express Edition free of charge from Microsoft to use as a control database for the Data Replicator. Review the SQL Server considerations above for more information. The SQL Server service must be running for the Data Replicator Service to access its control database. Start the SQL Server service from Windows Services, typically found under Control Panel—> Administrative Tools—> Services. Assuming you have installed a named instance of SQL Server Express on the local system, choose SQL Server Native 11 from the ODBC driver dropdown and enter SERVER=.\SQLEXPRESS for the connection string. Enter the SQL Server credentials for a user who is a member of the sysadmin server role. Click Next to proceed. On the next panel, enter a database name of ControlDB; this will create a new SQL Server database named ControlDB. Leave the schema name at its default of "dbo". Click Next. In the Select the Source pane, select Snapshot as the Replication Type and enter a schema or object name if you want to filter the source objects list. Click the Refresh button to display the available source objects in the right pane and select the source object you want to replicate. Click Next to proceed. In the Select Group pane, optionally select to add the subscription to an existing group or to a new group. Click Next to continue. On the Define Replication Schedule pane, configure a schedule for the subscription or leave the Scheduled box unchecked. Click Next to continue. Right click the newly created subscription and choose Run to start the replication. Double-click the replication event, indicated by the icon, to view the statistics of the replication. If the data did not replicate successfully, review the error(s) and take the necessary steps to address the problem.